After mixing scoop onto plastic wrap and use the wrap to form the mixture into a 5-inch pumpkin-shaped ball; chill at least 2 hours. 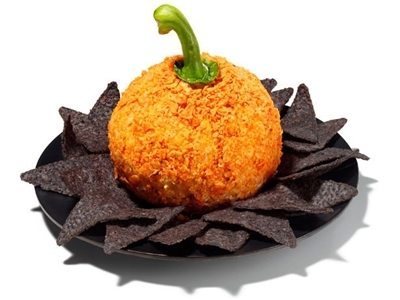 To serve, unwrap, roll in finely crushed nacho-flavored tortilla chips and press a bell pepper stem into the top. Serve as shown. Makes a great Halloween or Holiday hors devours.